IOCL Recruitment 2019: IOCL Recruitment has out the notification for the engagement of Trade Apprentices and Technical Apprentices posts. Indian Oil Corporation Limited is looking for young and efficient candidates. This time the IOCL vacancy is about 460+. The online application has brought up for eligible candidates to apply for the post. The apply online link will get activated on 16.02.2019 at IOCL Careers. Candidates who are seeking to set your career in most reputed central government organization kindly utilize this opportunity. The final date for the submission of an online application will get ends by 08-03-2019. Applicants kindly visit the official site and refer the official notification to know your eligibility criteria and recruitment process. If your eligibility criteria satisfy the prescribed criteria then start your application process. Submit your application on or before the last date. Further details regarding IOCL Recruitment 2019 is available in table format. Candidates kindly visit the official site iocl.com. In the home page, there will be a navigation link regarding IOCL Careers. In that page, you will find the recruitment link regarding IOCL Recruitment 2019 for technical & trade apprentice. IOCL Recruitment 2019: IOCL Recruitment has recently announced the notification for the engagement of Trade & Technician Apprentice posts. Indian Oil Corporation Limited is one of the largest oil refineries in India. Jobs in IOCL tends a great demand among aspirants. Candidates those who are having a passion to work in a central government organization kindly utilize this opportunity. This time IOCL Vacancy is about 420 around southern region. IOCL Online application & Official notification both are available in the official site. Interested aspirants kindly visit the official site iocl.com to read the official notification. Starting date to apply online will get starts on 18.01.2019. Final date for the submission of the application will get ends on 10-02-2019. So candidates should submit the application form on or before the last date. Other details regarding IOCL Recruitment is given in the table format. IOCL Recruitment Candidates should possess 10th/ITI/Diploma from any recognized board. The written examination is an objective type test. In the home page, there will be a navigation link for IOCL careers. Click on the careers link you will direct to the recruitment page. 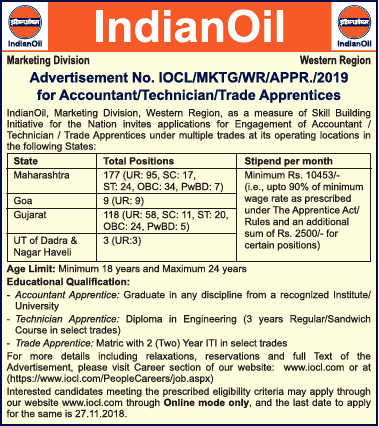 IOCL Recruitment 2019: Indian Oil Corporation Limited is ready to engage 420 trade apprentice vacancies. Eligible male and female candidates can fill up online application for IOCL recruitment 2019 apprentice jobs from 18th Jan 2019 to 10th Feb 2019. IOCL recruitment 2019 apprentice will shortlist based on the written test. IOCL Recruitment 2019 will be to the posts of 270 Trade Apprentice and 150 Technician Apprentice vacancies. Eligible candidates are suggested to go through the official notification before applying for IOCL recruitment 2019. Also, the applicant must satisfy the eligibility norms of recruitment body as prescribed on the official notification. Applications will be received only on prescribed format through the online mode. IOCL Recruitment 2019: IOCL Recruitment 2019 has rolled out the recruitment notification for the enrollment of Junior Engineering Assistants -IV posts. IOCL is one of the largest public sector oil refinery company comes under the list of Maharatna. The IOCL Recruitment board is ready to recruit the candidates who are having the educational qualification as Engineering. This time the board announced totally 68 IOCL Vacancy. Online applications are inviting from the candidates who are eligible to apply for the desired post. The official notification is available on the official site www.iocl.com. Kindly go through it to ensure your eligibility criteria. Online applications will be initiated from 07-01-2019. Candidates can start your application process after the initiation. The last date to submit your application process will be 28-01-2019. So applicants should submit your application process on or before the last date. Aspirants those who are having a passion to work in a central government organization kindly utilize this opportunity. IOCL Careers Candidates should possess Diploma 3 yrs course from any recognized board with 50% marks. IOCL Recruitment Minimum 01-yea post qualification experience in their relevant discipline. Candidates kindly visit the official site https://www.iocl.com/. In the home page, there will be a career section at the bottom of the page. Click the career section, you will get into the advertisement page. You will find the advertisement regarding IOCL Recruitment 2019 for Jr Engineering Assistant Post-IV. Click on this you will get the official notification. Start your application process after the initiation of an apply online link. Submit and send the printout of the online application form on or before 04-02-2019. IOCL Recruitment 2019: IOCL Recruitment 2019 has released the official notification for the enrolment of Junior Engineering Assistant & Material Assistant posts. Indian Oil Corporation Limited IOCL Recruitment board has announced totally 15 vacancies. Applications are inviting from the candidates those who have successfully completed the apprentice training in Guwahati Refinery in their relevant discipline under the apprenticeship act 1961. The above-said post comes under Non-Executive cadre in Grade-IV. Candidates those who are eligible as per the criteria prescribed by the IOCL Careers can apply for the above said posts. Applicants those who are having a passion to work in a most reputed central government organization can utilize this opportunity. IOCL is one of the largest public sector company which comes under the list of Maharatna company. IOCL Vacancy notification is available in the official site of IOCL Careers. Certificate verification will be held on 03-01-2019. So applicants should report at 10.00 AM to the given venue. IOCL Vacancy Candidates should possess a 3-years Diploma in their relevant discipline from any recognized board. Applicants should successfully complete 3 years Diploma in Instrumentation/ Instrumentation & Electronics/Instrumentation and Control Engineering from any recognized institute with an aggregate of 50% for Gen/OBC, 45% for SC/ST. /B Sc. (PCM) with an aggregate of 50% for Gen/OBC, 45% for SC/ST. Candidates should possess 3 years Diploma in Electrical Engineering from recognized Institute/ University with an aggregate of 50% for Gen/OBC, 45% for SC/ST. Candidates should possess 3 years Diploma in Mechanical/Electrical/Instrumentation Engg. from recognized Institute/University. Candidates should score a minimum of 40% mark in the written test. Applicants kindly visit the official site www.iocl.com. In the home page, there will be a link for IOCL Careers. Click on the IOCL Careers link, you will get into the recruitment page. In the recruitment page, you will find the advertisement regarding this IOCL Vacancy. Click on the advertisement, official notification will get open. Candidates should report at the venue on the given date and time. IOCL Recruitment 2018: Indian Oil Corporation Limited is inviting application to fill the post of Apprentice. The IOCL Recruitment is the recruitment to start the job in the leading government organisation. Likewise, This article will provide details of IOCL Recruitment. Furthermore, IOCL Vacancy is looking for the most desirable applicants. Further, the eligible applicants can apply and get the IOCL Jobs. Then, applicants can get the hand full of pay with wonderful job role. So, aspirants can go through the education qualification, experience qualification, Age limit, Job role etc. Then, applicants can refer to the official notification before applying for the post. Because only eligible applicants only must apply for the post. Firstly, The eligible and desirable applicants can follow below all steps to apply for IOCL Jobs. Also, The applicants should submit the noteworthy information to apply. Then, aspirants can check the information twice, before applying IOCL Vacancy. Also, applicants should submit the valid mail ID and mobile number for future contacts. So, candidates can apply for the post before the last date to apply. Finally, applicants can follow the official notification for timely updates. Applicants can apply for the apprentice program and appear to hold the excellent opportunity. This IOCL Careers will help to start excellent in leading government organisation. IOCL Recruitment 2018: Indian Oil Corporation Limited is inviting application form for Apprentice for various posts. This IOCL Recruitment is many focusing on Diploma applicants. The IOCL Recruitment 2018 is the looking for the eligible applicants. Likewise, IOCL Jobs is providing extraordinary allowances for employees. IOCL Jobs are also giving admirable allowances with a friendly environment for applicants. So, many of the applicants are eagerly waiting for IOCL Vacancy. Because IOCL Recruitment 2018 are readily availing for the applicants to provide a job in the government sector. To know further information about the IOCL Jobs, applicants can go through the below details. Also, here education qualification, experience qualification, age limit etc are given. So, applicants can make use of wonderful opportunity to hold a job through IOCL Recruitment 2018. Applicants can follow the below steps to apply for IOCL Jobs. Before IOCL Recruitment 2018 applicants should check the official notification. Furthermore, the direct link for the official notification of IOCL Vacancy is given above. Then, The eligible applicants can send the application for IOCL Jobs. Applicants can apply for IOCL Vacancy through Online Mode only. Applicants should not wait till the last date to apply. As server may down. IOCL has released the official notification for the recruitment of 2304 vacancies of Technical & Non Technical Trade and Technician Apprentice. One of the most awaited recruitment among the aspirants is IOCL Recruitment. Lot of applicants are looking for wonderful opportunity. IOCL vacancy is releasing a great career forum. Online applications are inviting from the eligible candidates those who are eligible to apply for this apprentice vacancies. This article provide you the detailed information of IOCL recruitment 2018. Candidates who are having passion to work in a Central government sector IOCL Jobs is a wonderful opportunity. Aspirants who are all eligible can crack the exam and get in to the most reputed organization. Candidates kindly submit your application form within 09th November and 17th November. You will get into the home page of the official site of IOCL Recruitment. In that you can see the Career link in the bottom right side of the page. Now you can able to see the recent notification notified by IOCL Recruitment. IOCL Recruitment 2018- Apply Online for IOCL Recruitment. Indian Oil Corporation Limited has released the recruitment notification for Trade & Technician Apprentice vacancies. There are a total of 155 vacancies that are allotted for these posts. So, the candidates who are interested to apply for these posts can apply through IOCL Recruitment 2018 Apply Online. The last date to apply is 9th November 2018. Utilize this opportunity in IOCL Career. Indian Oil Corporation Limited is prominent as the largest public sector company that meets entire country energy demands. IOCL is functioning since 1959. IOCL headquarter is located in New Delhi, India. Indian Oil Corporation produce products that are fuels, lubricants, petrochemicals etc. IOCL has around more than thirty thousand employees working in the company. Due to the IOCL performance, it is a Maharatna Company. Refer the official announcement from IOCL Jobs, before you apply. Scroll down for more detailed information on the IOCL 2018 Recruitment. Diploma in chemical Engg./Refinery & Petrochemical Engg. Visit the official website of IOCL that is www.iocl.com. Then, go the careers page. Find the notification link for Trade & Technician Apprentice Vacancy and open it. Read out the notification very carefully and check the eligibility criteria also. Fill out all the details and submit it before 9th November 2018. Send the print out of online application form through offline mode till the last date that is 17th November 2018. IOCl Recruitment 2018- Apply Online for IOCL Recruitment. Indian Oil Corporation Limited has released the recruitment notification for Trade & Technician Apprentice vacancies. There are a total of 1340 vacancies that are allotted for these posts. So, the candidates who are interested to apply for these posts can apply through online mode. The last date to apply is 9th November 2018. Indian Oil Corporation Limited is prominent as the largest public sector company that meets entire country energy demands. IOCL is functioning since 1959. IOCL headquarter is located in New Delhi, India. Indian Oil Corporation produce products that are fuels, lubricants, petrochemicals etc. IOCL has around more than thirty thousand employees working in the company. Due to the IOCL performance, it is a Maharatna Company. Refer the official announcement from IOCL Jobs, before you apply. Scroll down for more detailed information on the IOCL 2018 Recruitment. IOCL Recruitment 2018 – Apply Online for India Oil Recruitment 2018. IOCL Vacancy has come up with 390 Technical and Non-Technical Apprentices Posts. Interested candidates can ensure the eligibility before applying for the post. IOCL Online Applications are invited from the eligible candidates. Get more relevant information on IOCL Recruitment 2018. Applications for Indian Oil Vacancy is available at IOCL Online web portal. The IOCL Career receives the online application from 20th Sep 2018. Therefore the candidates can apply before the closing date of 12th Oct 2018.
other document will be accepted for verification of date of birth. Notification as well as in https://plis.indianoilpipelines.in under downloads section. After successful registration with the above agencies, a registration number will be generated and the candidate has to mention this registration number while applying for apprentices positions in Indian Oil Pipelines portal at https://plis.indianoilpipelines.in. There are two steps for the Registration process. Part-I & Part-II. In Part-I registration, the candidate has to fill his/her basic details like name, category etc. and has to create his own password. After successful Part-I registration, system generated registration number is sent in his registered email id/SMS. With this registration number, the candidate has again to login into the system with the password generated by him. Candidates are advised to remember registration number and password for future reference/use. In Part-II registration, the candidate has to upload his scanned photograph and signature and furnish educational qualification, experience details etc. and submit the same. IOCL Recruitment 2018 – Apply Online for India Oil Recruitment 2018. IOCL Vacancy has come up with 344 Technical and Non- Technical Apprentices Posts. Interested candidates can ensure the eligibility before applying for the post. IOCL Online Applications are invited from the eligible candidates. Get more relevant information on IOCL Recruitment 2018. Applications for Indian Oil Vacancy is available at IOCL Online web portal. The IOCL Career receives the online application from 01st Sep 2018. Therefore the candidates can apply before the closing date of 21st Sep 2018. The candidate who apply for IOCL Careers, attest the scanned copies of the relevant certificate separately. Xth std /SSLC /Matriculation certificate /mark sheet as proof of date of birth. Semester wise mark sheets of Diploma in Engineering. Certificate from Institute for stating the aspirant pursued through regular mode. 5 Recent color passport size photograph. Note: The candidate should refer official notification of Indian Oil Recruitment for more details. The written test will comprise of 100 objective type questions and shall be 90 minutes of duration. The questions would be bilingual i.e. English & Hindi. The weightage for Interview will be 15%. Examination Centre: Chennai, Hyderabad, Vijayawada, Cochin & Bangalore. Ensure the eligibility criteria for IOCL Recruitment 2018. Applicants are requested to apply before the deadline. Log on to iocl.com click the careers tab and find new recruitment list and select the relevant post. Scan the required documents in the prescribed format and fill up all mandatory information without any error. And take a glance at the application if the information is correct and click submit. IOCL Recruitment 2018 – Apply Online for India Oil Recruitment 2018. IOCL Vacancy has come up with 40 Non-Executive Personnel posts. Interested candidates can ensure the eligibility before applying for the post. IOCL Online Applications are invited from the eligible candidates. Get more relevant information on IOCL Recruitment 2018. Applications will be available at IOCL Online web portal. The IOCL Online Applications Starts from 01st August 2018. Therefore the candidates can apply before the closing date of 21st August 2018. Diploma in Chemical / Refinery & Petrochemical Engg. or B.Sc. (Maths, Physics, Chemistry or Industrial Chemistry). Diploma in Instrumentation / Instrumentation & Electronics / Instrumentation & Control Engineering. Recent color passport size photo. Bank account & chequebook with their names printed. Note: The candidate should refer official notification of IOCL Recruitment for more details. IOCL Recruitment 2018: Indian Oil Corporation Limited Board has been released notification at IOCL Career regarding hire 58 Junior Operator for IOCL. Applications are for Junior Operator IOCL Recruitment will be available at iocl.com. Eligible candidates can apply online for IOCL career. 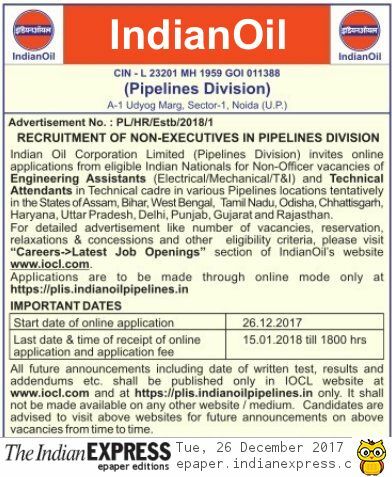 The link for IOCL jobs activated from 26th May 2018. The closing date for the application will be on 16th June 2018. So Interested candidates can apply before of closing date for IOCL Vacancy. The Tentative date for written exam will be on 15th July 2018. The selection of the candidates will be based on the written test as well personal Interview. Two years ITI in Electronics Mechanic/ Instrument Mechanic / Electrician / Machinist / Fitter. Higher Secondary with minimum 45% marks. Minimum one-year work experience in the relevant field. Minimum one year experience in Heavy Vehicle driving. The candidates who apply for IOCL Career should have age limit between Minimum 18 years and maximum 26 years. The Selection process would consist of two stages, that are written test and personal Interview. It would be like an objective type questions and the questions would be in English & Hindi. Note: The candidate who applies for IOCL Career should refer official notification of IOCL recruitment 2018 for more details about the selection process. The candidate who apply for IOCL Careers, please scan and upload relevant certificate separately for IOCL Recruitment 2018. Recent colour passport size photo. Bank account & cheque book with their names printed. The applicant who meets the eligibility criteria they can to apply for IOCL Recruitment. Applicants are requested to apply before dead line. Log on to iocl.com click the careers tab and find new recruitment list and select the relevant post. Read the official notifications carefully. Scan the required documents in prescribed format and fill up all mandatory information without any error. And take a glance on application if the information is correct and click submit. IOCL Recruitment 2018 – Indian Oil Corporation Limited Board has been released notification at IOCL Career regarding to hire 225 Technical & Non Technical People for IOCL. Applications are for Apprentices training available at iocl.com. Eligible candidates can apply online against IOCL career. The link for Apprentice jobs activated from 10th Feb 2018. The closing date for the application will be on 25th Feb 2018. So Interested candidates can apply before of closing date for IOCL Vacancy. The Tentative date for written exam will be on 04th Feb 2018. The section of the candidates will be based on written test as well personal Interview. Dear Readers, Routinely try to check our web portal or IOCL Career for latest and upcoming jobs. Here you can get all about the recruitment like recruitment Notification of IOCL, syllabus, results and more. IOCL recruitment board offers job opportunity for the graduates who would like to work under technical & Non –Technical Apprentice. There are 225 IOCL Vacancy avail to filling up. Interested candidates apply and grab this job as yours. Additionally you can get more details about IOCL Recruitment 2018. The candidates who wish to apply for IOCL Jobs they should have complete their Metric with 2 years of ITI or 3 years of diploma according to the requirements. Candidates advised to refer the official notification for clear education qualification for apprentice training. If the candidates complete any professional course like E or equivalent, MBA or equivalent or MCA / CA/ ICWA, LLB will not be considering for IOCL recruitment apprentice 2018. For Apprentice training at IOCL for fresh graduates only if the candidate undergone any apprentice training earlier from any other industry or organization will not be acceptable. Trade & Technician Apprentice will be getting a consolidated Stipend as per the Rules of apprentice with an additional amount of Rs.2500/- for stationery, Conveyance & Miscellaneous expenses. Consolidated stipend will be revised periodically in minimum wages as applicable to a particular location. IOCL Recruitment 2018 has offers an excellent opportunity for the candidates with the minimum qualification of Class XII to fill in Trade Apprentice. The IOCL Vacancy invites online application from the prominent candidates. IOCL Career has certain eligibility criteria for the posts mentioned. Follow the instructions provided below in our website for the post mentioned. Detailed eligibility criteria based on educational qualification, age limit and age relaxation is given below. Other details about the selection procedure, exam pattern, application fee details are provided for making the application process easier. Scroll down for more details about IOCL Career. Apply for the post before the last date of 19th Feb 2018. Dear Readers, IOCL Career notified 350 vacancies for the post of Trade Apprentice. Candidates can ensure the eligibility criteria before applying for the post. Follow the instructions provided below for easy application method. Individuals can also apply for the post from the link provided below before the last date. Minimum one year work experience in Heavy Vehicle driving (excluding training). Note: Age relaxation admissible to SC/ ST for 5 years and 3 years for OBC candidates. Xth std /SSLC /Matriculation certificate /mark sheet – verification of date of birth. Semester-wise / year-wise mark sheets of ITI (NCVT) / Graduation. Final ITI ( NCVT ) Certificate / Graduation Certificate issued by the respective Board / Authority. Individuals have to apply only through online for the post mentioned in the IOCL Recruitment. Those who are satisfying the eligibility criteria can follow the instructions to apply for the posts mentioned. IOCL Recruitment advises the candidates to ensure the eligibility requirements. Or by visiting the Official Website – iocl.org. Click on the “Careers” Tab from the dropdown menu options. From the loaded page click on the “Latest Job Openings” and Choose “Apprenticeship” Tab. Find the desired notification and choose “apply online” link. Send the filled application form to the below mentioned address before the last date of 19th Feb 2018. Indian Oil Recruitment 2018 has released the official notification for the post of Junior Operator. The IOCL Vacancy invites application for filling up of 58 vacancies by prominent candidates. IOCL Career has certain eligibility criteria for the posts mentioned. Follow the instructions provided below in our website for the post mentioned. Detailed eligibility criteria based on educational qualification, age limit and age relaxation is given below. Other details about the selection procedure, exam pattern, application fee details are provided for making the application process easier. Scroll down for more details about IOCL Career. Apply for the post before the last date of 10th Feb 2018. Dear Readers, IOCL Career notified 58 vacancies for the post of Junior Operator. Candidates can ensure the eligibility criteria before applying for the post. Follow the instructions provided below for easy application method. Individuals can also apply for the post from the link provided below before the last date. No application fee for SC / ST / PwD candidates. Send the filled application form to the below mentioned address before the last date of 10th Feb 2018. IOCL Recruitment 2018 – Indian Oil Corporation limited has officially announced the notification to recruit applicants for various posts. The IOCL Recruitment was looking for young enthusiastic vehement dynamic aspirants to fill up IOCL Careers. The applicants those who are entered through IOCL Recruitment will get handful admirable pay scale, with excellent atmosphere to work with such a wondering organization. IOCL careers will be the right place to build once careers. To know further details about IOCL Recruitment 2018 eligibility criteria like educational qualification, age limit, work experience, application fee details, pay scale details…etc aspirants can go through the detailed explanations given below. Indian Oil Corporation limited has published the notification to fill the huge vacuum thought IOCL Recruitment for the post of Junior Operator. This will be the right time for all the aspirants to make use of such a wonderful opportunity. To know further details aspirants can check below. The applicants those who are wish to appear for the above mentioned posts must be completed 12th with 45%. The aspirants those willing to apply for the above mentioned posts must have 1-3 years of minimum experiences. The candidates who are like to apply for IOCL Recruitment should pay Rs. 150 as application fees. Applicants can follow the below mentioned post to apply for this posts. Aspirants have to apply from the website https://www.iocl.com/PeopleCareers/job.aspx. Application from should be completed by filling all the details as they asked. Application fees can be paid through NEFT or Credit card or Debit Card… etc. The filled application form must be hard copied and sent to the postal address POST BOX NO. 8114, BANDRA (EAST), MUMBAI – 400 051 on or before 16th Feb 2018. Self attested copy of Education qualification certificates. Self attested copy of caste certificates…etc. IOCL Recruitment 2018 – Indian Oil Corporation Limited has been issued a latest notification to apply 98 Junior – Operator / Chargemen Vacancies. This article is all about to recruit young and eligible candidates for Indian Oil Corporation Limited recruitment. All around there are 98 vacancies to fill up for IOCL Recruitment. The job seekers who are waiting for IOCL careers notification can apply for Junior – Operator / Chargemen vacancies from IOCL Recruitment board. Here, you can get loads of information regarding IOCL recruitment such as age limit, educational qualification, selection process, application fee, and how-to- apply steps. The applicant of IOCL careers who wish to apply for this post should have done higher Secondary (Class XII) with minimum of 45% marks in aggregate for General & OBC candidates and 40% in case of SCSI candidates against reserved positions with valid Heavy Vehicle Driving License. Academic with minimum of 50% marks in aggregate for General & OBC candidates & 45% in case of SC/ST candidates against reserved position. The candidate at least they should have one year post qualification experience in relevant field from a factory/ manufacturing organization. Apprentice training under Apprentice Act after two years regular course of ITI will be considered as experience subject to production of National Apprentice Certificate issued by National Council of Vocational Training. The applicant must have minimum one year work experience in Heavy Vehicle driving (excluding training). The individuals must have minimum one year post qualification work experience in the relevant field from manufacturing organization. Apprentice training under the Apprentice Act 1961 after Diploma will be considered as experience subject to production of Apprenticeship Certificate issued by Ministry of RD. More details about age relaxation and other info go through the official notification issued by this recruitment board for your convenience we have attached in the below section. General / OBC candidates should pay Rs. 150/- as for application fee. Additional banking charges will be applicable. Duly self-attested semester- wise marks sheets and other educational certificates. Recent colour passport size photograph. The candidate who would like to apply for Indian Oil Corporation Limited Recruitment, Log on to iocl.com. Application will be available from 20th Jan 2018 @ iocl.com. The candidate click on the online application for the above mentioned post read all the instructions as per the notification fill it without error. Apply and pay your application fee in online gate which integrated with application. Finally submit the application and take two set print out copies. One is for future reference. Submitted applications should sent by ordinary post to POST BOX NO. 3321 , NUNGAMBAKKAM MDO, CHENNAI — 600 034. Postal Address POST BOX NO. 3321 , NUNGAMBAKKAM MDO, CHENNAI — 600 034. The IOCL Recruitment – IOCL Recruitment 2018 officially releases the notification to recruit Secretarial Assistant and Accountant. The IOCL Recruitment alert!!! Find and get recent notification from IOCL Career and Explore more IOCL vacancy @ iocl.com. IOCL Recruitment expects young, progressive and energetic invitees to apply for 101 vacancies. It is one of the Bulk IOCL Recruitment. Desired candidates should be aware about all updates in IOCL Recruitment2018. It is our pleasure to be a part of your success. It is Great opportunity for freshers to kick off their life with better environment. Selected candidate will be rewarded with High Emolument and all permissible allowances. Important eligibility criteria about Indian Oil Corporation limited are given below. Furthermore details of IOCL Recruitment 2018 also available here. For Queries read the official notification. Candidates with B.A/B.Sc/B.Com along with minimum of 55% aggregate mark for OBC and general can apply for IOCL Recruitment. Candidates from SC/ST/PwBD category can apply with minimum of 50% aggregate marks in all semester for IOCL vacancy. Candidates have to possess B.com degree with above mentioned criteria based on the category can apply for IOCL Recruitment. Candidates having eligibility to apply for IOCL Recruitment 2018, age limit should be between 18 – 24 years and relaxations are as per the Government Regulations. Candidates will be filtered by following processes in IOCL Recruitment. Make sure that all the related documents needed to apply for IOCL vacancy is available in Soft copy. Then click what’s new tab in IOCL Career and then selected the appropriate notification. Select the desired post for which you eligible and interested. Fill the application correctly without any error and submit the application form before the last date in IOCL Career. Take a printout before the last date of application form for future use. The IOCL Recruitment 2018 – Apply for 58 vacancies across India. IOCL recruitment board recently announce new vacancy list from various discipline such as engineering, Quality control, Nursing etc,. Eligible and experienced candidates can apply for IOCL Recruitment board before closing date of application. Interested job seekers can utilize this opportunity from IOCL Recruitment and find more latest and upcoming notifications @ iocl.com. More useful info about this job notification you can get it in the below section. Scroll down and get more info. Dear applicants, IOCL Recruitment- Indian Oil Corporation limited has announced the IOCL Recruitment 2018 for 12 / Diploma / Nursing aspirants. This IOCL Recruitment 2018 will be the wonderful opportunity for the candidates who are looking to start IOCL Career. IOCL Recruitment will provide a hand full of pay with excellent atmosphere and more additional benefits for employees to build a perfect career. For details like educational qualifications, age limit, pay scale…etc, are given below. The IOCL Recruitment 2017– Indian Oil Corporation Limited has invites applications from eligible candidates to fill up Engineering Assistant, Technical Attendant, Engineers/ Officers, Assistant Officer Posts. Eligible candidates can apply through online before last date of IOCL recruitment 2017. Scroll down to get more information like qualification, education, how to apply in the down section for IOCL recruitment 2017. Find the official notification of IOCL recruitment 2017 on below section. Dear Readers, Are you looking for change over from your current job? If it is yes this is an opportunity for you to enter in Indian Oil Corporation Limited (IOCL). Every year Indian Oil Corporation Limited conducting recruitment drive to hire young and energetic candidates. Openings are available for Fresher/Experienced candidates on IOCL Career. Eligible candidates can apply anywhere from India through online for IOCL Career. IOCL Career-For the post Engineering Assistants under Electrical/Mechanical/T&I division the candidate should have done BE/B.Tech in relevant field from recognized university. For the post of technical Attendant, the candidate should posses diploma from government recognized institute/ Board. The candidates of IOCL Career will get future announcement on https://plis.indianoilpipelines.in and https://iocl.com regarding for this job. Application will be active from 26th Dec 2017 and application received only by online mode. This recruitment is for non- Executives from pipeline division from IOCL. Candidate can get more information about the official notification for this particular job should log on to above mentioned website and click career for Latest Openings. Opening available from various states such as Bihar, Assam, West Bengal, Tamilnadu, Odisha, Chhattisgarh, Haryana, Uttar Pradesh, Delhi, Panjab, Gujarat and Rajasthan. The candidate should have done BE/B.Tech in Civil/Mechanical/CS/IT/EEE/Electronics and communication/ Instrumentation engineering discipline. General and OBC candidates with minimum of 65% of marks and SC/ST/PWD candidates with minimum of 55% of marks scored in their engineering examination. The candidate who is pursuing bachelor degree in final year/ the candidate pursuing /Completed ME/M.Tech can apply for this job. The candidate from General/ OBC should obtained 60% of marks. The applicant from SC/ST/PWD category should get at least 55% of marks in their academics. The candidates, who wish to apply for the post of Assistant officer, Should have minimum 2 years of experience in relevant field as on 30th June 2018. The candidate who willing to apply for this post, they should have maximum 26 years as on 30th June 2018. Age relaxation available for others, the candidates are requested to refer official notification in the below section. For Assistant officers the candidate should have maximum 30 years of age as on 30th June 2018. Age relaxation available for others, the candidates are requested to refer official notification in the below section. The selected candidates for the post of officers/Engineer will get basic pay of Rs. 24,900/- per month. Other allowances will be applicable as per IOCL norms. After the engagement of the job of Assistant officers, the candidate will be receive Rs. 20,600/- per month. The selection of above mentioned post will be based on Gate exam -2018. Other or previous year exams of Gate will not applicable. The candidate should face Group Task (GT), Group Discussion (GD) and personal Interview (PI). The candidate who would like to apply for IOCL Career, Log on to http://www.gate.iitg.ac.in/ and apply for Gate-2018. With the registration number of Gate -2018, the candidate can down load the application from IndianOil website for IOCL Career. Application will be available from 05th Jan 2018 @ iocl.com. The candidate click on the online application for the above mentioned post read all the instructions as per the notification fill it with Gate-2018 register number. Indian Oil Corporation Limited (IOCL) has recently announced the IOCL Recruitment Notification for the year 2017-18. This IOCL Recruitment Notification was released for engagement of Technician Apprentice & Trade Apprentice. Eligible candidates can apply for IOCL Recruitment post on or before 10th December 2017. Here below we have given the eligibility criteria, Educational Qualification and other details. Dear Readers, IOCL – Indian Oil Corporation Limited has invite applications for the post of 381 Technician Apprentice & Trade Apprentice. Here you can find detailed information about IOCL Recruitment 2017. Based on the qualification eligibility criteria you can apply 10th Dec 2017 for IOCL Recruitment 2017. Application is available in online at www.iocl.com for IOCL Careers. More details about IOCL Recruitment 2017 given below. Interested and eligible candidates can apply for IOCL Recruitment. Technician Apprentice-Mechanical: The candidates should posses 3 years fulltime regular sandwich/diploma course in Mechanical Engineering from recognized university for IOCL Recruitment. For Technician Apprentice- Electrical: The applicant should have done 3 years fulltime regular sandwich/diploma course in Electrical Engineering from recognized university for IOCL Recruitment. Technician Apprentice-Instrumentation: For IOCL Recruitment Candidates should done 3 years fulltime regular sandwich/diploma course in Instrumentation &Electronics/Instrumentation & Control Engineering from recognized University/Institute. Trade Apprentice-Fitter: IOCL Recruitment – The candidates should posses 2 years fulltime regular courses from ITI (Fitter) from recognized University/Institute. Trade Apprentice-Electrician: For IOCL Recruitment the candidates should posses 2 years fulltime regular courses from ITI (Electrician) from recognized University/Institute. For Trade Apprentice-Electronics Mechanic: The candidates should posses 2 years fulltime regular courses from ITI (Electronics Mechanic) from recognized University/Institute for IOCL Recruitment. Trade Apprentice-Instrument Mechanic: IOCL Recruitment – The candidates should posses 2 years fulltime regular courses from ITI (Instrument Mechanic) from recognized University/Institute. Trade Apprentice Laboratory Assistant: The candidates should posses 2 years fulltime regular courses from ITI (Physics,Mathematics,Chemistry/Industrial Chemistry) from recognized University/Institute for IOCL Recruitment. As per IOCL Recruitment 2017 candidates should have minimum 18 years and Maximum age limit 24 years as on 01st Dec 2017. Selected candidates can get consolidated stipend as per Apprenticeship Rules of IOCL Recruitment board with an additional amount of Rs 2500.00. Consolidated stipend is subject to the periodic revision in Minimum Wages as applicable to particular operating location. Candidates will be selected by two step selection procedure. Final screening will be done by IOCL Recruitment Board. At the time of interview candidates should bring all your original testimonials along with self attested photocopy of all the documents. Xth Std /SSLC/Matriculate certificate/marksheet issued by the concerned education board for the D.O.B proof. No other documents will be considered for date of birth. Latest caste certificate by reserved category candidates by the Govt. Relevant educational certificate from recognized University/Institute in regular mode for year of passing. Semester wise /Year wise marksheets of Diploma in Engineering/B.Sc(PCM)/ITI Course. Final Diploma in Engineering/B.Sc certificate /ITI issued by respective Board/NCVT. Note: The candidates should bring all the above original documents at the time of personal Interview for IOCL Recruitment 2017. The verification will be done at the time of interview by IOCL (Indian Oil Corporation Limited) Recruitment team. The applicant is eligible with above eligibility criteria you can apply online before 10th Dec 2017 to IOCL Recruitment board. Application link will be in official website www.iocl.com(Careers-> Latest Job Opening-> Engagement of Apprentices in Eastern Region (Marketing Division). Candidates should apply only on online mode. Applications will not accepted any other way. After filling application required scanned documents should be uploaded without fail. Incase absent of single document will not be eligible. Eligible candidates will be called for written test detailed information intimated you by email/sms. Download your admit card at the time of written test for IOCL Recruitment 2017. IOCL Recruitment For Trade Apprentice: The prescribed qualification shall be from a recognized University / Institute as a full time, regular course in relevant discipline with minimum 50% marks in aggregate for General & OBC candidates and 45% marks in aggregate in case of SC/ST/PWD candidates against reserved positions. IOCL Recruitment For Technician Apprentice: The prescribed qualification shall be from a recognized University / Institute as a full time, regular / sandwich Diploma course in Engineering in relevant discipline with minimum 50% marks in aggregate for General & OBC candidates and 45% marks in aggregate in case of SC/ST/PWD candidates against reserved positions. Carefully read the full advertisement for details of educational qualification & other eligibility criteria before submission of on-line application. Official Notification of Indian Oil Corporation Limited was given below. Candidates those who are applying for this Indian Oil Corporation Limited Recruitment should be minimum 18 years and maximum 24. Age Relaxation was application for SC, ST, OBC and PWD Candidates, kindly check the Official Notification of IOCL which was given below. Applied candidates who have shortlisted on the basis of the performance in the Online Written Examination and Personal Interview which will be conducted by Indian Oil Corporation Limited. Written exam conducted for 85 marks and Personal Interview will be conducted for 15 marks. Written Test shall be of Objective Type Multiple Choice Questions (MCQ’s). Out of 85 questions, 50 questions will be from concerned discipline and 35 questions on General Aptitude and Reasoning, General English/Hindi, Numerical Aptitude and General Knowledge. short-listed candidates for Written Test, should download their Admit Cards for appearing in the Written Test through online portal only on the notified date. Eligible aspirants can apply for this Recruitment by filling the Online Application. Eligible candidates are applying for this Recruitment should have a active email & Mobile number, this must be vaild for at least 1 year. Candidates must have all the required documents, photograph and scanned signature copy in jpeg format. Submitting the Online application check the application twice, make sure all the information are correct. Indian Oil Corporation Limited is Indian government owned oil and Gas Company. IOCL headquarter is in New Delhi. In India, Indian Oil Corporation Limited is the largest commercial enterprise and its products are refining, pipeline transportation, marketing of petroleum products, exploration and production of crude oil, natural gas and petrochemicals. Indian Oil has its Research and Development centre at Delhi NCR.